The story begins as a young alien woman named Dusk arrives on Earth to warn the population that a giant extraterrestrial being, known as the Sun-Eater, is heading our way. Dusk is a member of an unknown alien race, and does not speak or understand a word of English, so Saturn Girl uses her telepathic powers to translate and teach her the language. Dusk has attempted to warn hundreds of worlds, prior to Earth, about the Sun-Eater. Each planet had tried, in its own way, to stop the Sun-Eater, but every attempt was as unsuccessful as the last one. This has convinced Dusk that the Sun-Eater is indestructible. 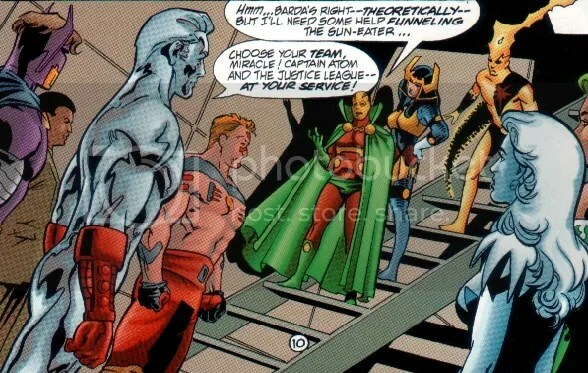 Despite her warnings, the Justice League still try to stop the Sun-Eater. For their first attempt, Mr. Miracle tries using his boom tube to send it into another dimension. This proves unsuccessful, since they discover that the Sun-Eater is not entirely in our dimension. 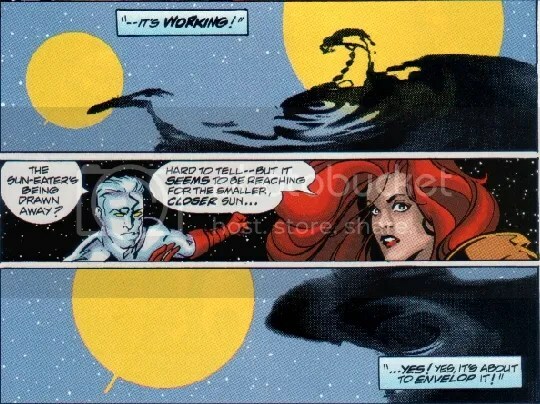 As a last resort, Superman and several other “heat-producing” heroes combine their energies to create a second sun and try to lure the Sun-Eater away from Sol. The Sun-Eater quickly consumes that sun before moving on to Sol. As Sol is extinguished, Earth falls into chaos, and the planet starts to freeze. There are only five days to restore the sun, after which Earth will become too uninhabitable. Powerless to do anything to stop the freeze, the League tries to help control the chaos and to keep hope alive. Many people freeze to death. Wildcat is badly injured. Etrigan the Demon offers the entire world heat at the cost of their souls; the world rejects him, primarily because his plan was to shift Earth to the dimension of Hell. 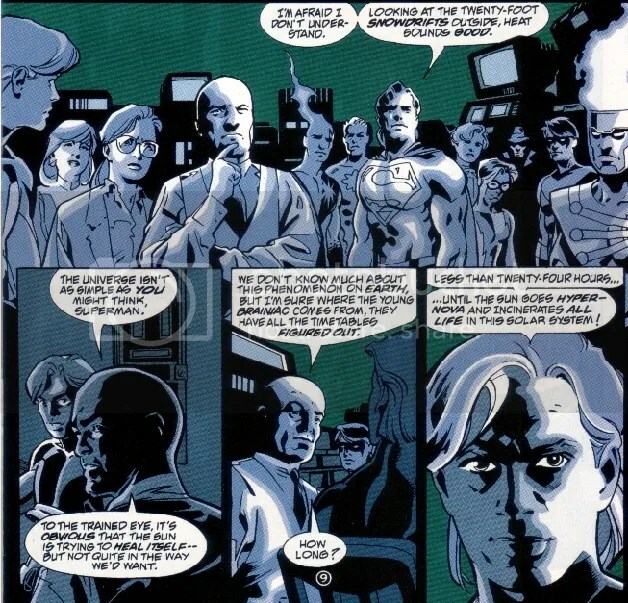 Lex Luthor teams up with the League to try to reignite the Sun. The events of this series cross over into other books as well. Superman encounters Ferro Lad, who would later make an abortive attempt to destroy the Sun-Eater. The Ray devotes his attentions to a small Mexican town. Tommy Monaghan (Hitman) holes up in his favorite bar, Noonan’s. Seeing Earth as just another failure (and after being attacked by an angry mob who had accused her of bringing the Sun-Eater to Earth), Dusk decides its time for her to move on. As she prepares for take-off, she encounters a stranger, and is shocked that he understands her language. The stranger takes Dusk on a quick trip around the world and shows her the League’s efforts to keep hope alive. Dusk doubts that there’s any hope left for the world. Eventually, the stranger disappears and Dusk is left alone in an alleyway. She is found by a small group of people and, thinking they are going to attack her again, prepares to defend herself. To her surprise, the group offer to take her to a shelter where she will be safe. This act of kindness gives her hope for the planet. Meanwhile, scientists have realized that the sun is losing energy but not mass to the Sun-Eater. This will cause the sun to nova, and the explosion will catapult the Sun-Eater into another solar system where it will consume another sun. The assembled heroes construct a technological means of destroying the Sun-Eater. Lex Luthor angrily bows out of piloting the ship needed, revealing that he was in it simply to save his own skin. 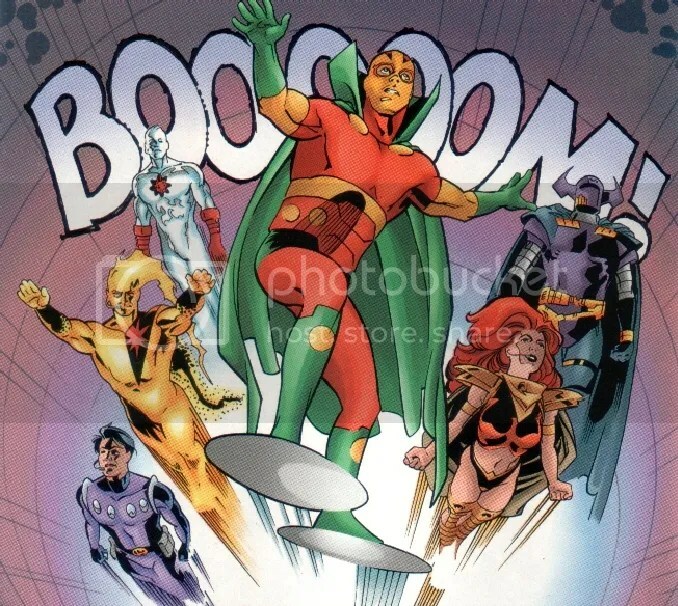 Ferro Lad steals the ship, only to be shunted back to Earth by Hal Jordan, the former Green Lantern then known as Parallax. 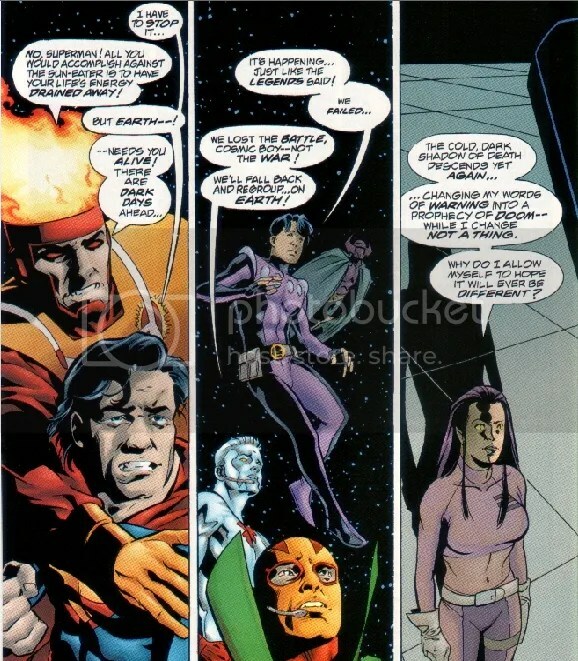 Parallax sacrifices his life to absorb the Sun-Eater and reignite the sun, simultaneously using his powers to safely restore it to its original form without causing any side-effects such as the mass flooding that would have resulted if the sun had been restored purely by Luthor’s plan. The League watches in astonishment, and Dusk says she no longer believes anything is impossible. One lasting effect of Final Night is the resurrection of Oliver Queen (otherwise known as Green Arrow). Queen’s resurrection was not revealed until years later in his own comic series, where he was found living homeless in an alley, having been resurrected by Parallax— using the near-microscopic remnants of Queen’s body that remained on Superman’s costume after he was atomised by an explosion when Superman was unable to free him from a bomb— before the final fight with the Sun-Eater. 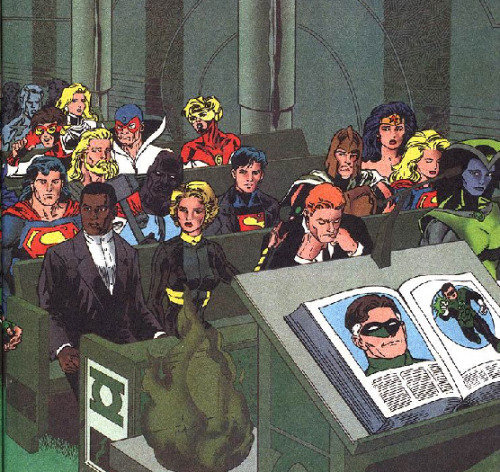 The Final Night also established the seven core members of the Justice League. 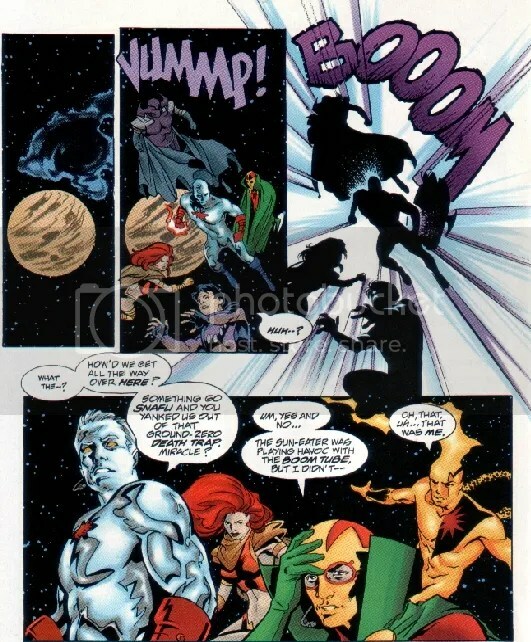 On a smaller scale, the sun’s temporary ‘demise’ allowed the powerful being known as Traitor (an old foe of Abin Sur and Hal Jordan who ‘fed’ on the energy of dying stars, his close proximity to the Sun blocking his access to the energy he needed when he was left trapped in its orbit after a battle with Hal and Ray Palmer) to escape the sun’s orbit and regain his old power, before Kyle Rayner managed to defeat him once again. The seed is also planted for Hal Jordan’s future resurrection and return as a Green Lantern on this story, as the remaining energy Jordan took from the Central Power Battery preserved his body inside the sun. 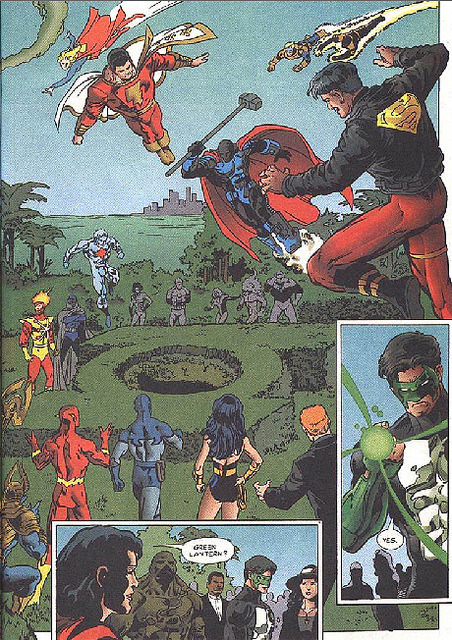 In Green Lantern: Rebirth, Kyle Rayner traveled to the center of the sun to retrieve Jordan’s body and has a new insight in the true nature of Parallax. Jordan returns to the living as a hero once more, and his villainous actions have been retconned as being under the influence of the fear entity Parallax and Sinestro, who was revealed to be alive and orchestrated Jordan’s downfall. 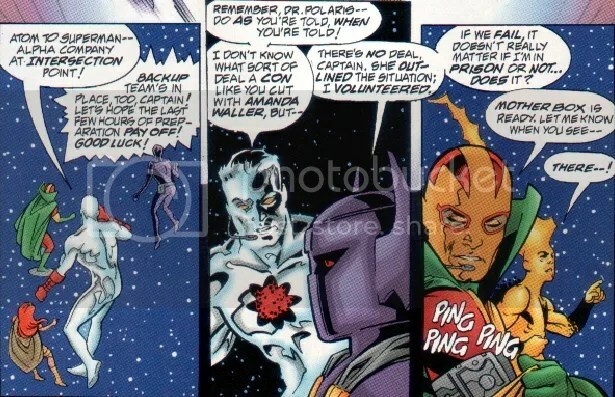 Captain Atom appears in two other DC titles tied in to The Final Night. 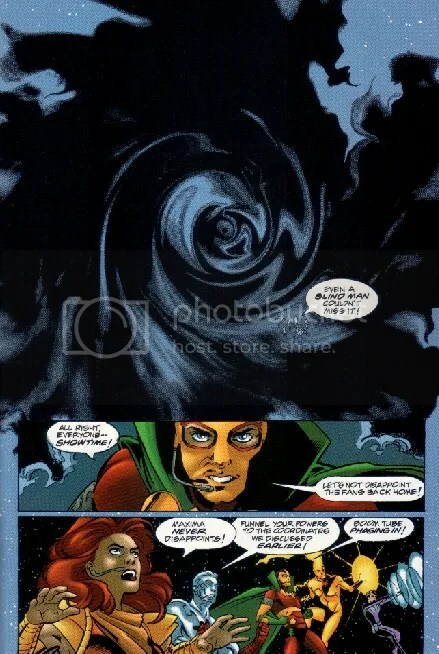 In The Flash #119, he is shown in a single panel when Wally West is telling Linda Park about the events of The Final Night. 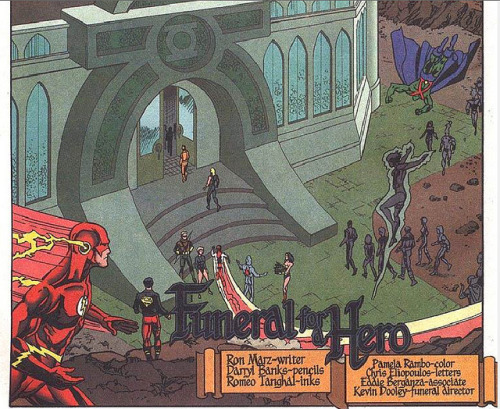 Captain Atom also attended the funeral for Hal Jordan in Green Lantern #81, and was seen in four different panels. 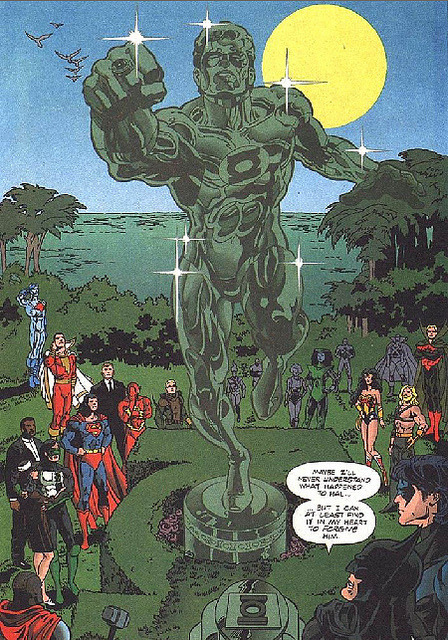 On the last page, he is seen saluting a statue of Hal Jordan that had been erected in the ruins of Coast City. This synopsis was cut-and-pasted from Wikipedia on 9/26/2013. I apologize for any errors and invite you to point them out to me for correction.